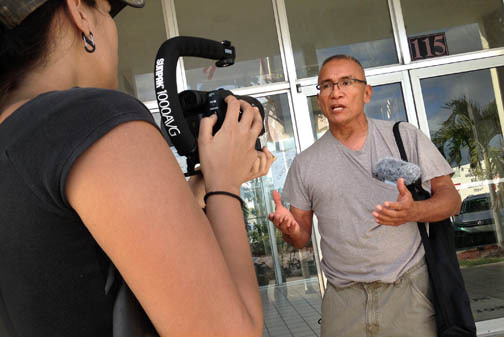 Tribal citizen Samuel Tommie stands on the steps of the Clewiston commission chambers and speaks out against plans by Hendry County and Florida Power & Light to build electrical energy plants near Big Cypress Reservation. HENDRY COUNTY — Florida Power & Light (FPL) was granted another delay by the Hendry County Board of County Commissioners for a final public reading of amendments to the county’s comprehensive land use plan needed to pave the way for electrical power facilities on land adjacent to Big Cypress Reservation. The last reading was to be presented March 8 but commissioners, citing ongoing discussions with landowners affected by the changes, voted instead to postpone the reading to April 12. Three amendments likely to be passed include one that adds “electrical generating facility” as a new future land use category; one that adds a subarea policy specific to 3,127 acres next door to the Big Cypress Reservation; and one that changes the zoning on the 3,127 acres from agriculture to electrical generating facility on the county’s comprehensive plan future land use map. The continuance is the second delay in FPL’s effort to tweak the language of the county land plan and ultimately allow power generating facilities whether solar, gas or other on FPL land immediately north of the reservation line through Deer Fence Canal along County Road 833. Recent discussions with Tribe leaders have resulted in substantial modifications to previous amendment change petitions, according to documents filed with the county Feb. 22 prior to the rescheduled reading. The most significant change is FPL’s new plan to use the 3,127-acre area for solar power generation only, at least for 10 years. The solar panels and associated apparatus will be no higher than 20 feet tall and staged no less than 100 feet from County Road 833 and the north border of Big Cypress, according to documents. A massive gas-powered electric plant – one of the largest in the United States – was originally planned for the site. The power company also owns about 4,500 acres north of the proposed solar plant location flanked by several plots that still belong to McDaniel Ranch. During a Feb. 8 Big Cypress community meeting, FPL representatives used a map to illustrate that the original and larger plant, complete with three 15-story steam towers, would be moved to the northern site. County commissioners have so far sided with FPL against objections from environmentalists and Tribal citizens. About a dozen protesters walked March 8 in front of the Clewiston city commission chambers where county commissioners met inside. Commissioners did not discuss the issue but Hendry County Planning and Community Development Director Margaret Emblidge stated that the gas generation plant originally planned for the south property was off the table. The name of the facility has also been changed from Hendry Next Generation Clean Energy Center to Hendry Solar Energy Center. Still, concerned citizens, including Tommie, spoke publicly against the plant during a public comment period. “You need to stop the rezoning and consider what is really happening. You will be opening the door and inviting the gas power plant to come in later on,” Tommie said. Ruddy Kijewsky, who represented Everglades Earth First, said the promise of solar power is not good enough. “We need to remind people what industrial solar power will look like because it will still cut a swath through sensitive land. It will still be destructive,” Kijewsky said. But while ongoing discussions between FPL and Tribe officials have led to some hope for compromise, no mention of the north end property becoming home to a gas powered electric power plant is made in the amendment revisions. The Tribe’s struggle to block the power company from building near the reservation has been ongoing since 2011 when the county issued an ordinance that allowed the plant. FPL and the county argued for job creation, increased tax revenue and future electric power needs based on Hendry’s plans for community growth and development. The Tribe, environmentalists, local citizens and historians countered that the massive plant would interrupt or destroy endangered wildlife and plants; culturally sensitive property; and the quality of air, water and the night sky. Subsequent court rulings deemed that plans for neither the power plant nor the ordinance passed by the commission were in agreement with the comprehensive land plan anyway. In March 2015, FPL submitted three comprehensive land plan amendments to address ambiguous language and in July 2015 the county commissioner moved the process forward by sending the amendment changes to Tallahassee for state review. Several state agencies, including the Department of Environmental Protection, Wildlife Conservation Commission and Department of Education were required to comment on the issue. Only one responded negatively. The Southwest Regional Planning Council recommended that the project meet Dark Skies lighting guidelines and firmly suggested that FPL and the Tribe negotiate ways to lessen other environmental effects. Fort Myers resident Lex Hood, who has been a friend of the Seminole Tribe since 1960, said he traveled more than an hour to attend the county meeting in Clewiston.